Congress leader from Kerala Shashi Tharoor, whose long-letter wordplays on Twitter in the past won him fans as well as critics, is caught in a farrago of criticism for a recent tweet about the fisherfolk community. 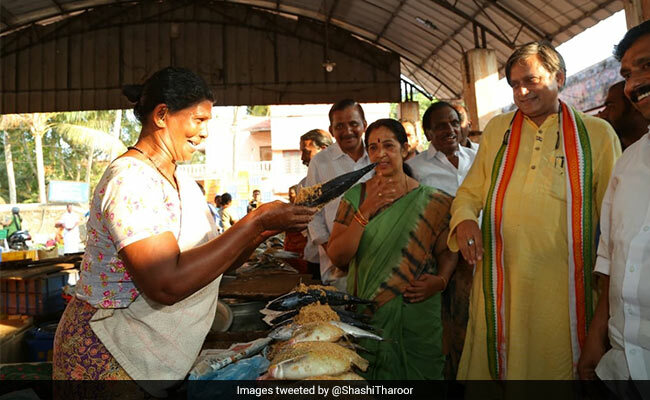 While campaigning at a fish market in his constituency Thiruvananthapuram, he wrote a series of tweets, one of which was: "Found a lot of enthusiasm at the fish market, even for a squeamishly vegetarian MP!" Then a massive backlash followed, with many, mostly his detractors slamming him for allegedly "insulting the fishing community" and a "savarna attitude" - referring to caste-based preference for vegetarianism. In a tweet, writer NS Madhavan criticised the Congress parliamentarian, who is looking to score a hat-trick from Thiruvananthapuram Lok Sabha seat, saying, "Deconstruction: I'm a vegetarian, therefore I'm a savarna." The BJP weighed in on Mr Tharoor's tweet. "A considerable population of Thiruvananthapuram are people who live by selling fish. They have no option but to live with that smell. Such statements can be expected only from people like Tharoor who live immersed with perfume worth lakhs," the BJP posted on its official Facebook page. Reacting strongly, Mr Tharoor in a press conference denied allegations that he hurt the feelings of the fisherfolk. "When I said squeamishly vegetarian, I was making a joke of myself, of my lifestyle choice. Most of the people in my family, including my sisters and one of my sons eat fish. I have nothing against it. I in no way pointed to the fishing community. And to say I am a casteist is ridiculous. Everyone knows I have written books on this and I grew up in a family where my father even dropped his surname", the Congress leader told reporters. "My political rivals have nothing to raise their fingers against me and that's why they have indulged in false opportunism, weaved around lies. Let us face it. They are trying to eat into some of my votes. These lies will not work," he said. "I have worked for and lived with the fishing community. I was the first one to call Defence Minister Nirmala Sitharaman during the floods and I repeatedly raised questions, demanding funds for cyclone Ockhi victims as well as drawing attention to the failure of Doppler radars," Mr Tharoor said. In 2014, he won from Thiruvananthapuram with a narrow margin of 15,000 votes against BJP's O Rajagopal. It was the votes from the coastal belt that had come to Mr Tharoor's rescue in the last rounds. Mr Tharoor is not new to controversies with his choice of words. In 2009, his comment on traveling "cattle class" was criticised even by some top Congress leaders. Why Shashi Tharoor Thinks This Fluffy Food Item Is The "King Of Foods"